Happy fall, y'all! We're having perfect fall weather here, but the leaves are starting to turn. There's really no denying that fall is here with pumpkin everything in the stores. 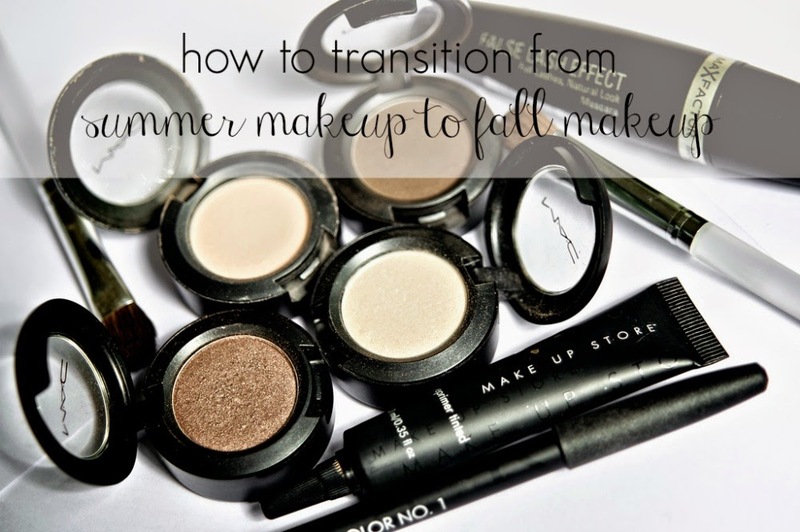 Here are some tips to help you transition from summer makeup to fall makeup so you'll look your best without having to buy more products. Although if you are like me, buying more products won't break your heart. During the summer, women sweat glow in the heat. I always dust some arrowroot powder under my mineral foundation to absorb excess moisture. In the winter, I skip this step unless I'll be wearing makeup all day. I also switch to a liquid foundation when I need to get dressed up a little bit in the winter and need better coverage. The colder air will dry out your face, so you might to get a more intensive moisturizer. I like to use just plain coconut oil as a moisturizer, but it's too oily for the daytime in the summer. I use it at night in the summer, but I can use it morning and night in the winter. I also really like Oil of Olay because it has an SPF of 15. I like having a sunscreen on my delicate facial skin all the time because I think it helps prevent the signs of aging. Darker matte colors are in for fall. If you love your lipstick shade and don't want to change, blot with a one-ply tissue to tone down the shine. Your lips can get really dry as the weather gets colder, so keep them nourished with a lip balm or use a lip scrub to remove dead skin cells. Metallic lips are also popular for fall. Don't want to buy new shades? Use metallic eyeshadow to cover your lips. You can use it by itself or dab some over a similar shade. Summer eyeshadows are shimmery and light, but call colors are gray, silver, green, and plum in a satin texture. You can darken your existing colors by using a black or charcoal gray eyeliner. Use a brush or a cotton swab to smudge the liner so it's not as harsh. Don't have a dark liner from last year? Use an eyeliner brush and use a dark eyeshadow as eyeliner. The harsh sun in the summer can really damage your hair. Start off fall with a hydrating hair mask like this one with Moroccan Oil, or you can make your own with this recipe. Do you change your look with the seasons?